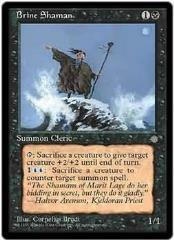 Card Text : T: Sacrifice a creature to give target creature +2/+2 until end of turn. "The Shamans of Marit Lage do her bidding in secret, but they do it gladly. -Halvor Arenson, Kjeldoran Priest"